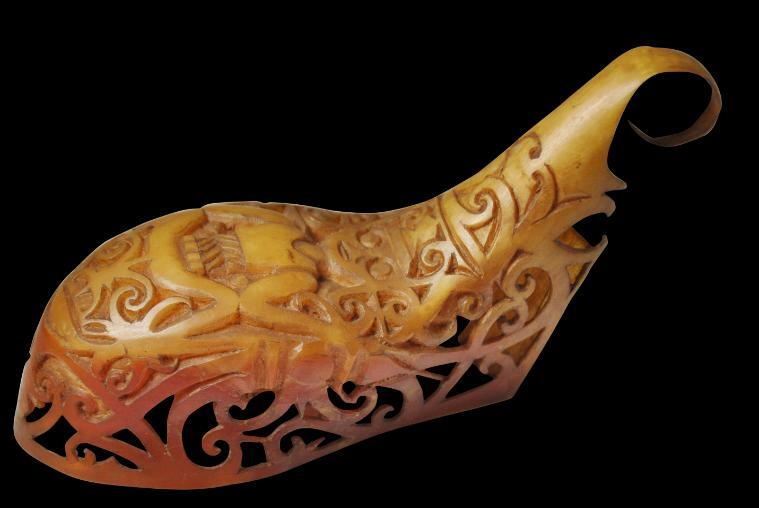 This ear ornament carved from a single piece of hornbill casque or beak would have been worn in a man’s extended earlobe. Often such ornaments were worn singularly rather than in pairs, and even if two were worn, they did not necessarily match. aso motifs. The upper section, which takes in the more cream-coloured part of the casque, is carved in high relief with a humanoid ancestor figure surrounded by aso-inspired scrollwork. The figure wears an extravagant headdress and a girdle around its waist, mirroring traditional Dayak dress. The ornament includes a hook which allowed the ornament to be suspended from the elongated or stretched ear lobe of the wearer. aso is a mythical underworld hybrid dragon-dog female fertility figure. 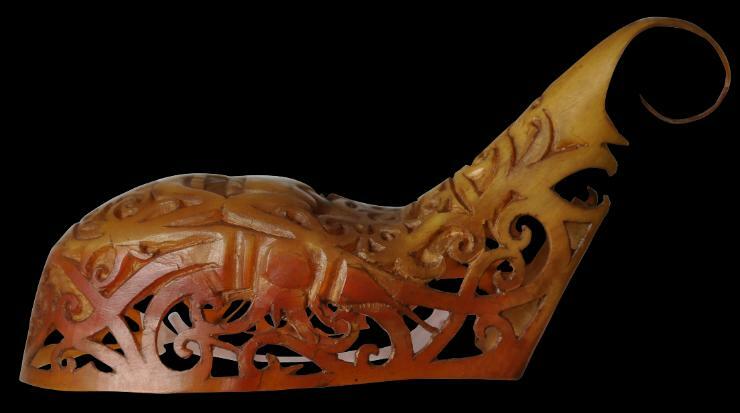 Richter (2000, p. 174) says that such ‘curvilinear vitality’ may be derived in part from dragons or other mythical creatures portrayed in Chinese trade ceramics that were imported into Borneo in vast quantities. Rhinoplax vigil) is a large forest bird known for its enormous orange-red beak and casque and dark blue feathers. It was regarded with enormous symbolic importance among the Dayak of Borneo’s interior and played an important role in their creation myths. Many of Borneo’s indigenous groups traditionally viewed the hornbill as a representation of the upper-world god. The wearing of hornbill feathers and carved casques during ceremonies conveyed the high status, power and prestige of the wearer. Certainly the wearing of ornaments fashioned from hornbill tended to be restricted to men. The casques are made of solid kerotin and are strong but also readily carved and pierced. According to Brinkgreve & Stuart-Fox (2013, p. 232) among the Kenyah Dayaks of the Apo Kayan region of Borneo, only successful headhunters were allowed to wear ear ornaments made from hornbill ivory. Related examples are illustrated in Meulenbeld et al (1988, p. 233), Brinkgreve & Stuart-Fox (2013, p. 232), and Rodgers (1995, p. 281). The example here is in fine condition. 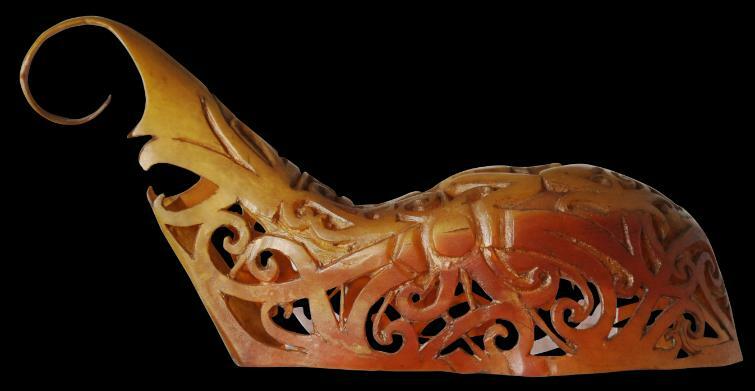 It is finely carved and has a soft patina consistent with use and considerable age. Brinkgreve, F., & D.J. Stuart-Fox (eds), Living with Indonesian Art: The Frits Liefkes Collection, Rijksmuseum Volkenkunde, 2013.
et al, Budaya Indonesia: Arts and Crafts in Indonesia, Tropenmuseum, 1988. The Jewelry of Southeast Asia, Thames & Hudson, 2000. Power and Gold: Jewelry from Indonesia, Malaysia and the Philippines, The Barbier-Mueller Museum, Geneva, 3rd ed. 1995. Acquired in the UK, from the estate collection of Dr George Yuille Caldwell (1924-2016). Dr Caldwell, an English-born physician moved to Singapore in the 1950s, from where he built up a collection of mostly Borneo-related textiles and other ethnographica.